Depart from your centrally located lodging in Tbilisi by a well-maintained vehicle to explore the main attractions of Tbilisi and Mtskheta. Holy Trinity Cathedral, Metekhi Church, the Monument of Vakhtang Gorgasali, Narikala Fortress, Sulphur Bathhouse District, and Rezo Gabriadze Theatre are among the main sights you’ll see in Tbilisi. Following a smooth drive of approximately 20 kilometers, you’ll arrive at Mtskheta, where you can explore its UNESCO World Heritage Sites such as Jvari Monastery and Svetitskhoveli Cathedral, besides a tour to Samtavro Monastery Complex. Return transfer to your Tbilisi location is included. Start your Kazbegi Tour from your hotel in Tbilisi, where you’ll be picked up on time. As you make your way along Georgian Military Road, you’ll first stop at Ananuri Fortress Complex and Jinvali Water Reservoir, which is followed by stop off at Pasanauri. See two different colored (white and black) rivers meet here, as you soak up the refreshing scenery of this mountain hamlet. Another attraction covered in your tour program is the ski resort of Gudauri, where you can engage in many thrilling activities like skiing and paragliding. Return transfer to your hotel is included. Jet off to Georgia on Rayna Tours’ four-night breathtaking holiday! Rife with incomparable picturesque allure, unique for its wonderful collection of UNESCO sites, and most of all, enriched by the presence of warm-hearted people, a Georgian holiday offers an endless spectrum of memorable experiences and so does our expertly compiled package with accommodation, tours, and all transfers. On Kakheti Wine Tour from Tbilisi, step directly into the classic Georgian scenery and discover the fascinating wine producing techniques which date back to over 8000 years. 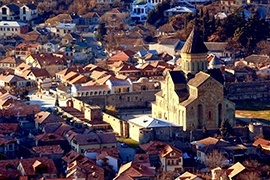 You’ll not only sip remarkable quality Georgian wine but also make a trip to many mesmeric attractions as part of this excursion, such as Sighnaghi – acknowledged as the City of Love, and Bodbe Monastery which overlooks Alazani Valley. 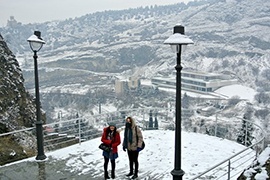 Next, take a full day city tour, wherein you’ll spend some time exploring Tbilisi’s line-up of ancient and contemporary sights and then press on to explore the age-old masterpieces of Mtskheta which once remained the capital of Georgia until 5th century AD. Above all, this holiday will give you the ultimate chance to experience the verdant greenery and enigmatic beauty of the Great Caucasus Range, with a sightseeing trip of Kazbegi. Tour Ananuri Fortress that was built in 16th century, enjoy the Aragvi River confluence views at Pasanauri, and then make your way to the renowned Gudauri Ski Resort. Beautifully arranged service from start to end...!! It was my best friend's bachelorette party, and I wanted to make it really special for her. I contacted Rayna Tours through email and they helped me choose this travel package as it was exactly what we needed. We were a group of 5 friends including the bride-to-be. I must say that we had the time of our lives. This was really special holiday and my best friend really loved it. Thank you Rayna Tours for making this possible! It was really a breathtaking experience! When we thought of European holiday, we wanted to do something different from the regular tourist places. Our tour representative at Rayna helped us to pick Georgia and this tour package. Georgia is a stunning place, and it was one of the best holidays we had. The Tbilisi and Mtskheta city tours were interesting and informative. We really enjoyed the sightseeing tours. But what we liked best was the day tour to Kazbegi. Apart from sightseeing, we also got to enjoy paragliding and skiing at the ski resort of Gudauri. In short, we would say that it was 4 days of fun!